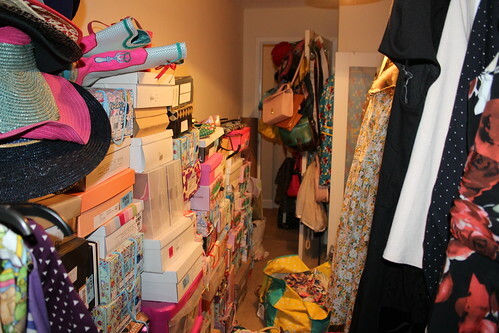 One of my main requirements for the ongoing house hunt is that there is enough space for a walk-in wardrobe. At the moment, it seems as though I have a bit of a "floordrobe" situation going on, due to owning too many clothes lack of space. That said, it seems I am not alone. According to some research done by UK Flooring Direct, more than half of Briton use their bedroom floors to store clothes, even though most of these people have plenty of wardrobe space. Those polled were asked ‘Are there currently clothes on your bedroom floor?’ to which 43% said no, with 57% admitting that there were. When those who did have clothes on the floor were asked how many of these garments were clean and how many were dirty, the average answer was revealed to be 40% clean and 60% dirty. Grim. Now, I don't think I'm quite as bad as some of these people. Whilst I do use some storage bags on the floor of my wardrobe room (spare room) to store out-of-season clothes, I don't store any dirty clothes on the floor. Also, I am gradually tackling the lack of storage space as I've been clearing out the clothes which no longer fit me or which I no longer wear, and listing them up for sale on my Instagram sale page for a couple of weeks or so, before donating whatever I have left to charity on a regular basis. I do accept that I still have a way to go, though. I plan to seriously reduce the amount of clothes and shoes I have to take with me when I move house. (hopefully soon). I'm slightly embarrassed to admit that in searching for today's outfit, I actually discovered that I had this dress twice. One from a few years ago, which is now a few sizes too big and I must have re-bought it. I have vague memories of tracking it down on eBay in my now size a while ago but clearly hadn't got around to getting rid of the old one. Oops. I have now. 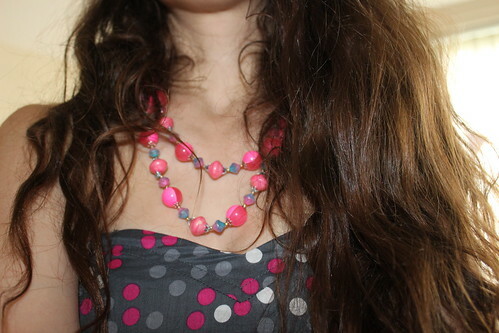 This necklace was something I came home with from my favourite charity shop after dropping last week's big bag of clothes off to them. They have learnt to expect me every week with something or other for them and often save me the things they think I may like, which is lovely. Like these vintage beads. So, do you have a "floordrobe"? And if you do, are you brave enough to share it? Thanks! 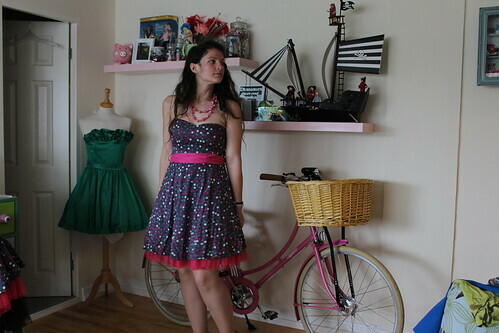 I had completely forgotten I'd re-bought this dress. I have been trying to reduce the amount of things I have lyign around - like the pile of clothes which had been waiting to be altered / fixed. For so long. As I wasn't convinced I was actually going to wear them even after they had been altered or fixed, I didn't bother and just donated the whole bag to a charity fabric recycling bin. I sometimes have a pile of ironing on the floor, which slowly gets spread about but dirty clothes go straight into the laundry bin. I don't have enough storage so I have lots of piles of books and stuff about which drives me crazy but I don't think I'd be brave enough to share it! I don't have enough storage space either, and have been running out of space for books on the shelves lately - i don't read fast enough. But at least it's the village fete this weekend so I will hopefully be able to take a bag of books for their book stall. I have a bedrobe!! My soRe bed is a mountain of clothes. It was also like that in my old house!!!! Whoa, your spare room is jammed! That dress is v pretty! Worryingly, this is a lot better than it used to be! I can't believe the size of your shoe collection- it's impressive, and I'm sure this is just a small chunk of them. My shoe collection is tiny and I really need to work on it! I ocassionally store a couple of pairs of shoes or bags on the floor when I can't work out where to put them, but I try to put my clothes away as I go along. I get stressed if my room is too messy. Although I'm very tight on both wardrobe and drawer space. Sometimes i get so annoyed with all the clutter and wish I had less stuff, to be honest. Agreed -- dogs will train you not to leave stuff on the floor. It becomes a dog bed or worse! I appreciate the peek at your wardrobe room too -- I also have many, many shoes (though mine are less exotic -- my husband claims that most of them are pretty much the same!) and I need to find a better way to organize them and the rest of my clothes so that I can get to everything. Right now I have taken over both the master bedroom walk-in closets but it is getting hard and hard to actually, you know, *walk in*. LOL. Good luck with the house-hunt! I was looking at shoe cupboards recently on Ikea's website and I'm sort of tempted for when I get the new place. I have very serious dress envy here! that dress is beautiful and as hannah has said you look stunning in it. My youngest has the worst floordrobe I have ever seen, honestly. So bad that I stopped washing and ironing her clothes in order for her to understand quite how frustrating it was to have clean, ironed clothing thrown on the floor only to reappear in the washing having never been worn. Haha, thank you =- well, it's double is for sale on the IG page as I don't think it will fit me again. No floordrobe, but that first photo is my bedroom....imagine me in my bed in amongst it! One of my wardrobes is a shoe cupboard, so i don't have room for the clothes that should be in there, there's a chair somewhere in my room, piled up with that stuff. I can't even get into the shoe cupboard anyhow because of shoe boxes piled in front of it. It's ridiculous, but when I eventually get my shoe room, I'll get my other wardrobe back, yay! 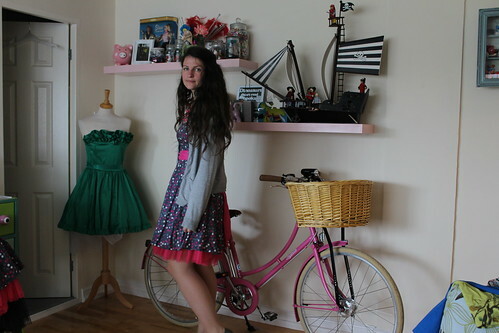 Oh gosh, my old room used to be like that before I moved out.